Clumpy Granola with Stewed Rhubarb | Naturally.Clumpy Granola with Stewed Rhubarb | Naturally. Preheat oven to 300°F (150°C) and line a baking sheet with parchment paper; set aside. Bake for 40 to 45 minutes, rotating halfway through, until lightly browned and fragrant. Remove from the oven; let cool completely. Gently break up the granola into clumps and store in an airtight container at room temperature for up to 2 weeks. 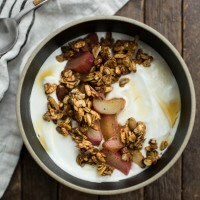 Divide the yogurt among four bowls, add a ó cup of granola to each bowl (there will be 1 cup granola left over), and then divide the stewed rhubarb among the bowls.